Welcome to the New Release post and Blog Hop showcasing projects from Our Daily Bread Designs May Release! You can see all of the May Releases here. Continue reading below to find out how you can win one of three $25 Gift Certificates to the ODBD Store good towards the purchase of ODBD stamps. Today I'm sharing two Mixed Media projects using some of the products from the May Release along with some previously released Custom Dies, stamps and ODBD Pattern Paper. My first card is rather CAS Black and White design. 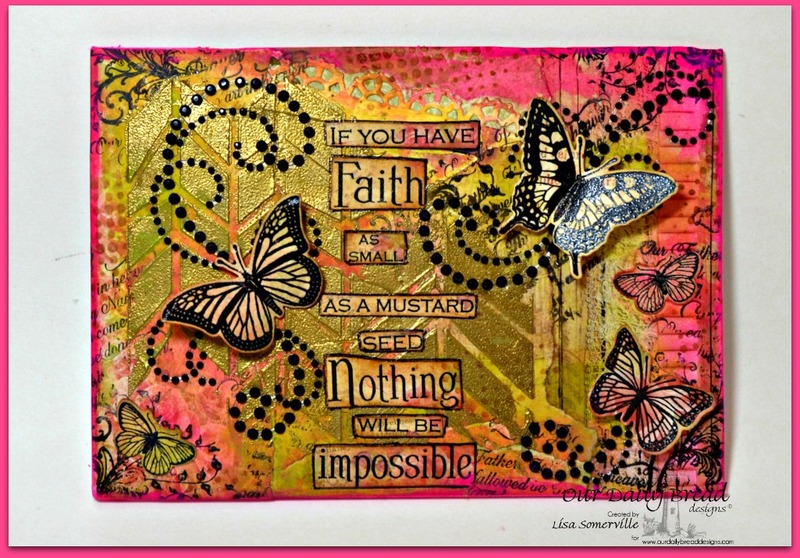 I used a stencil from Just a Trace and Modeling Paste to create the background, then added various ODBD Dies (see supply list) and a stamped butterfly from the Trois Jolies Papillons stamp set, die cut with the Trois Papillons Die. The stamped butterfly is layered onto the new Fancy Fritillary Die. My next project is a Mixed Media Canvas. 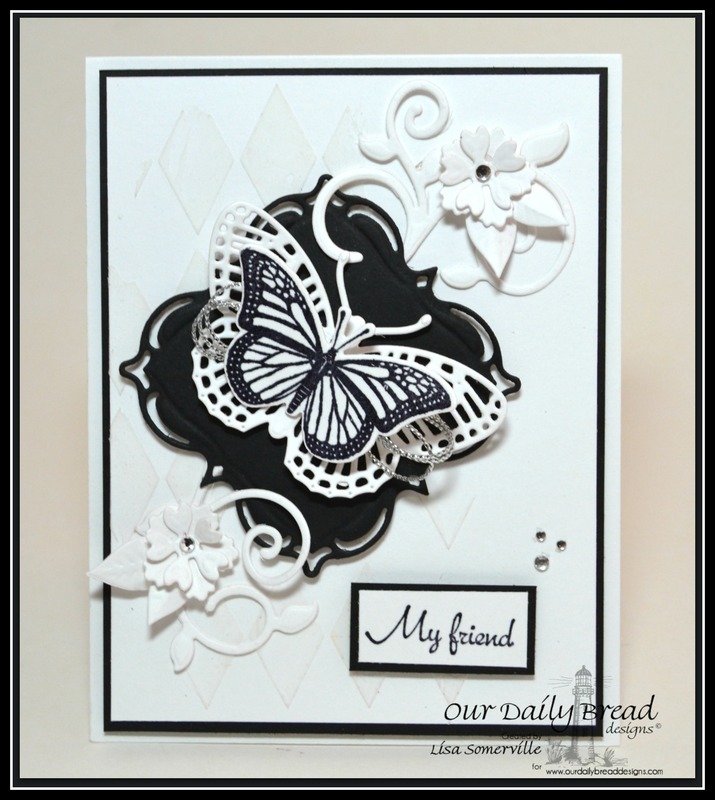 To add to my canvas, I Black embossed the butterflies from the Trois Jolies Papillons stamp set and die cut with the Trois Papillons Die. I also added a few stamped and die cut butterflies using the Butterfly and Bugs stamp set and die. The verse is from the Seed Packet stamp set. Three randomly selected winners will each receive a $25 gift certificate to Our Daily Bread Designs, good towards the purchase of ODBD stamps found in the "stamps column" of the ODBD Website, just for commenting on the Design Team cards! You have until Saturday, May 2, 2015 at 9:00 p.m. EDT to leave your comments. The Winners will be posted May 3rd, on Our Daily Bread Designs Blog, so be sure to check back there to see if you won! Both of your cards are gorgeous. Beautiful job on this new release. Stunning BW card, Lisa! And, wow....love the mixed media card!! So creative!! Both cards are really pretty, but the collage card with the bright colors really steals the show. I really like the new stamps and dies. Your B&W CAS card is beautiful. Hi Teamie. LOVE the Black and White for card its fab contrast and use of lovely layered cuts. The bright Mixed Media project is out of this world -incredibly gorgeous! WOW! So proud to be working alongside you. Thanks for the inspiration. The black and white card is so elegant. thanks for sharing. The black & white card was WOW! Black and white card is lovely. The canvas looks amazing with all that rich colour contrasting with the black butterflies and bling. I'm betting the gold embossing must look fabulous in real life. The black and white card is so elegant looking. Love the variety!! Gorgeous clean design on the card and the mixed media canvas is so awesome!!! HUGS!! love the BW one ..so elegant!! Beautiful cards, Lisa!! I just love the black and white classic and clean design on the first and the bright and cheery colors of your mixed media design of the second! Gorgeous! Beautiful samples Lisa! I absolutely love your black and white one... it totally pops and the die cuts really are perfect! The mixed media card is so full of texture and sheen, and eye popping color! Just beautiful! Two very different looks, so cool! awesome creations!! the mixed media canvas is very nice.. the card is totally awesome! Well, the black and white card has won me over....I'm a sucker for that color combination. You're very versatile as evidenced by your two different cards..the black and white...fantastic. The card with all of the colors...eye catching. You're very talented!! Love the black and white card Lisa! And you definitely are the queen of mixed media! I love your style! Wow Lisa - your first card may be CAS but wow is it stunning. I love the contrasting shapes and all the texture in the white flower elements. But it's the matting that really makes this so stunning to me. Your second card in contrast is OVERTHETOP amazing. I love all the colors and textures, I had to look and look to see all the wonderful details like the prayer, and the lacey square. The chevron pattern is fun too! This card is so creative and unique - and I love it!!! Ooooo, I love your bright butterfly canvas on display at ODBD blog. It is "my cup of tea." Your black, white and cream canvas is appealing, as well. love your mixed media canvas, it is so striking, love the colors and the embossing. Beautiful!! Fabulous techniques you used on both and those butterflies are all so gorgeous. Beautiful black and white design and love your canvas. Black/white is always a beautiful choice! Your colorful mixed media canvass is awesome-ness....!! Love em both! Hi Lisa, Very creative. My favorite is your bright canvas. Love all the different textures, the stenciling, the punch detail and the rhinestone swirls. Beautiful! Both are so striking and I always love seeing your mixed media take with the ODBD products! Both cards are very creative. The black and white card is very striking and so dramatic. Your cards is beautiful. I love the layered butterfly. The mixed media canvas is gorgeous! I love the bright cheerful colours. Beautiful! The cards are so different, yet each is absolutely gorgeous. Thank you for sharing your talent. Wonderful b&w card and colorful canvas. Your card is gorgeous! I like how you used the dies in an unusual and creative way! I need to think outside the box more and this inspires me. I have not done any mixed media, but your canvas is so colorful and the quote is great. WOW, Lisa...both mixed media cards are masterpieces! Love the layered butterfly on the first and of course the texture is wonderful! The detail on the second is incredible! Both cards are so different yet both beautiful! Hugs, my friend! Well done on both projects. I especially enjoyed the CAS card. Well done. love ur CAS card>>so elegant!! I love that you created two cards that were so totally opposite but both are so gorgeous. Wonderful use of these new releases. Wow!! What a huge difference between your projects!! They are both stunning! Wow, Lisa, from the first white card, with the cool stenciling paste, to the 2nd gorgeous mixed media, they are both stunning!! Love the 2nd since its so bright and pink! Your black and white card is very striking! I like how you cut up the seed packet, and pieced it together on your mixed media card! Great work! Love the elegance of the first card and the mixed media feel of the second one. Both are so pretty and elegant. Hugs, Gracie. These are super projects, Lisa! 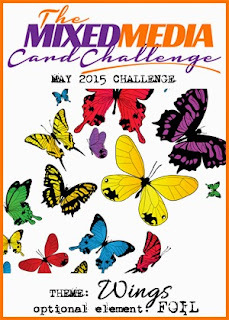 Love the layout and bg on your butterfly card. Simple & striking! Your mixed media is so bright & colorful. Love all the areas of interest. Both the card and canvas are very pretty. I never imagined a b n w card cud b so stunning. Thank you for joining us at MMCC.